Chris Mann powering forward for Howe's first score. By Chris Reekie. Following the narrow defeat to Glasgow Accies last week the visit to Lasswade was another crunch game at the bottom end of National 2. Howe received the kick off, playing with the wind and immediately set up an attack which ended with a miss directed pas, dragged behind the receiving player by the strong gale blowing down the park. The initial advantage went with Howe when No 8 Chris Mann forced his way over for a score, which Suttie was unable to convert. This should have acted as the catalyst for Howe to build on, however, it was Lasswade who demonstrated a greater hunger. They played a simple game, runners aiming to drive up the middle of the park. Not attractive but effective in the conditions. Howe were defending well, but transgressed, not releasing the ball in the ruck which gave Lasswade a simple three points from a penalty in front of the posts. Given the more physical approach adopted by Lasswade it came as no surprise when they powered over for a try, which went unconverted. Both sides worked hard in the conditions trying to create openings. Their rumbustious prop Hood barrelled past a couple of defenders, running hard for the line, only to be chopped down yards short and unable to make the crucial offload. Howe were able to reduce the deficit when Suttie kicked a penalty. As the first half came to a close, Lasswade were reduced to 14 men as one of their props received a yellow card. Howe elected for a scrum, rather than kick to the corner and work a driving lineout. With a retreating scrum Howe were unable to get the solid platform to launch an attack, instead giving away a penalty to allow Lasswade to relieve the pressure and with it the referee blew for half-time. Playing against the wind can often be more effective to attack as the ball drifts back into the hands of the runners. Howe certainly appeared more fired up and their opponents made the same basic errors in handling as Howe had playing with the wind. Despite some very close attention by the Lasswade defence, Howe’s No 10 Suttie dodged and weaved his way through to score and convert his own try to take the lead once more, 10-15. It was then the turn of Howe to receive a yellow when captain Lawrie was penalised for not releasing at the breakdown. Lasswade took full advantage of the extra man to score their second try and with the conversion, restore a two point lead. 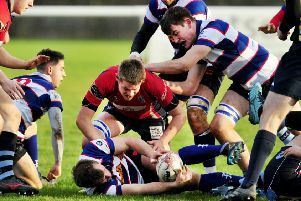 The Howe scrum were under constant pressure on their own ball, Mann having a torrid time in getting any sort of steady foundation from which to set up a drive into the Lasswade defence. Neither side were ablee to gain any sort of ascendency. The number of mistakes and poor decision making, along with a lack lustre referee, caused the game to lose any fluidity and cohesion. For Howe, too many individuals working hard but not as a unit. Lasswade sticking to their simple game plan and despite another yellow, there was to be another before the end of the game, created their third try with the forwards once more instrumental in the score. With a successful conversion they led 24-15. As manfully as Howe tried, too many chances were lost through a lack of a cutting edge and poor decision making. Yet they managed to gain field position close to the Lasswade try line for Hood to squirm under the defence, scoring between the posts to give Suttie an easy conversion for. The game was now in the balance, yet Howe could find no direction, as hard as they tried to probe the defence and give their strike runners space for an attacking opportunity. Sadly, the referee drew the game to an end and another very close league defeat for Howe. This team has resilience, what they lack is an edge to their game, a hardness that comes with experience and age. Up this weekend will be Preston Lodge who make the journey to Duffus Park.